NEW HIGH BID: OSU Jersey Auction - Auction Ends Tonight! 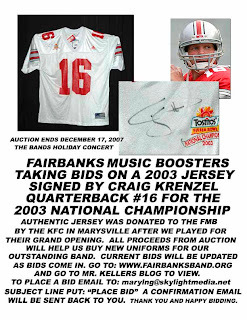 Thanks to KFC's grand opening, we have a Craig Krenzel autographed Ohio State football jersey from OSU's national championship year. I comes with a certificate of authenticity and a fine frame enclosure. The music boosters are holding a silent auction between now and December 17th, with all the proceeds benefiting the FMB uniform fund. Place your bid by emailing your name, phone number, and bid to Mary Ellen Garwood at marylng@skylightmedia.net. Watch this space for bid updates as they come in!